The Red Oak, Quercus rubra, the New Jersey State Tree, is a large, native and beautiful tree, the Ewing Environmental Commission’s chosen Tree of the Month. Its USDA Hardiness Zone is zones 4 to 8; Ewing lies in USDA Hardiness Zone 6B. This tree is found all over Ewing and surrounding wood lots. In normal springs, the Red Oak leafs out in early May. Around the same time the tree develops pale, yellow-green hanging catkins, 2-4” long “pollen strings”, on which the abundant pollen forms. The fallen pollen strings clump on the ground, mess up our decks, patios, and walkways, make us sneeze, and clog up drains and noses. The flowers are insignificant. Fortunately there are attributes which make us forget the allergies and mess. This tree is rounded to broad-spreading, and grows to a height of 50-75’. The leaves are dark and lustrous, to 8” long, with toothed lobes which are sharply pointed at the ends. The leaves turn yellow to red in the fall. The fruit, acorns, often do not appear until a tree is 40 years old, and it takes the acorn 2 years to mature, ripening in late August to late October. Insects, rodents, squirrels, deer, turkeys and other birds and mammals consume the acorns. Native Americans ground the acorns into a flour to bake with. The red oak bark is ridged, smooth grey to brown. Red oak wood, which is pale reddish-brown, is coarse grained and is used for furniture, floors, veneers, and firewood. 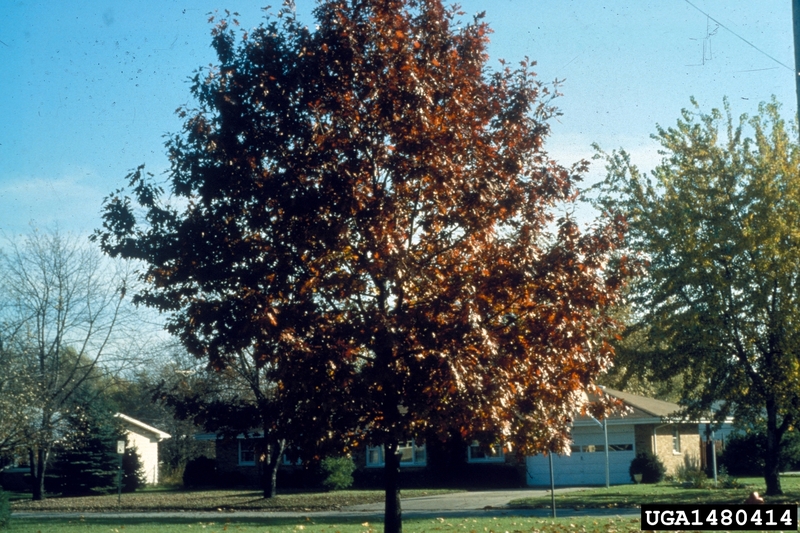 Red Oak favors deep, acidic soils with dry to medium moisture and full sun. This is a large tree with deep roots so it must be planted where it will have a lot of space, such as in large lawns, golf courses, and parks. It is a wonderful shade tree. Oaks may harbor caterpillars, and Oak Wilt occasionally occurs. If the pH of the soil is too high, chlorosis, or yellowing of the leaves, may occur. Allergy sufferers should close windows and outside doors and turn on the air conditioning when the oak catkins are present; don’t hang laundry outside, and sweep up the catkin masses whenever possible to get them out of the way. Wear sunglasses to protect your eyes, have someone else mow your lawn, and don’t rake leaves during pollen season. Pets can be rubbed off with a damp towel when they come indoors, and perhaps should not share your bed.